Biotherm has launched Biotherm L'Eau, the latest in their series of perfumed body sprays. L'Eau carries the subtitle "The energizing fragrance of Lait Corporel". The last in the series was 2014's Eau Fraiche. Ever wanted to save the enticing scent of Lait Corporel the whole day? Now the iconic Lait Corporel fragrance in a bottle to refresh, energize and invigorate yourself all day long. Allow yourself to be carried away by the sparkling freshness of the zesty orange fruit, the smoothness of the freesia and the soft perfume of cedar wood. Additional notes include bergamot and mandarin. 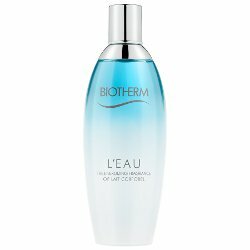 Biotherm L'Eau is available in 100 ml.